(GAMEWEEK 3) at Emirates Stadium, London. LONDON - Arsenal saw off rivals Tottenham to prevail at the North London Derby to pick up an important win at home with Giroud's lone goal being the difference. 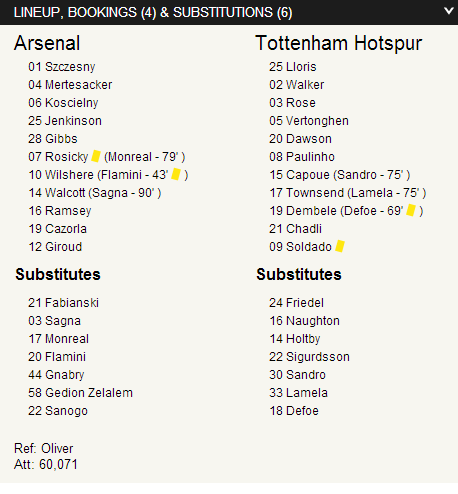 Arsenal got the proceedings underway in North London with the set-pieces coming early. Tottenham whipped in the first corner of the game just a minute in, and Santi Cazorla verified Hugo Lloris goalkeeping ability with an excellently curled free kick of which was saved. Three minutes later, the Spaniard would once again come close from the free-kick, as it went underneath the wall but went wide. Lloris and his defenders were well beaten, but the post wasn't. Tottenham erupted in a spell of great play on the flanks, dominating them with a few chances around the 10 minute mark. Roberto Soldado had a decent look-in on goal when it was cut back, but Mertesacker blocked and it went out to safety. The game settled in but things did not quieten down, Arsenal got the ball, squandered possession, or had a chance and vice versa. But then the deadlock was broke in the 23rd minute. Theo Walcott's perfect timing in his run down the right allowed him to cut it across to Olivier Giroud for a delightful finish to give Arsenal the 1 - 0 lead. Walcott caused more troubles for Tottenham in the 25th minute when a great run by Ramsey fed the shot although Lloris would save emphatically. It developed into an open, entertaining game of football. Chances came and went. On the half-hour mark, there was a decent opportunity for Ramsey to fire it in to goal when Walcott squared the ball but it went way over the bar. Just after half an hour through the game, Arsenal fans were vocal after goalkeeper Hugo Lloris sprinted out to challenge Theo Walcott. The referee did not book him and replays suggested it was well-timed. However Rosicky would get booked for a hesitant foul in the fallout from the incident. Jack Wilshere was substituted for Mathieu Flamini mere minutes before half time as he picked up an injury. The Frenchman returned to play after he was signed earlier in the week. Wilshere's injury is a big blow for the England squad too, who face important qualifiers in the next ten days. 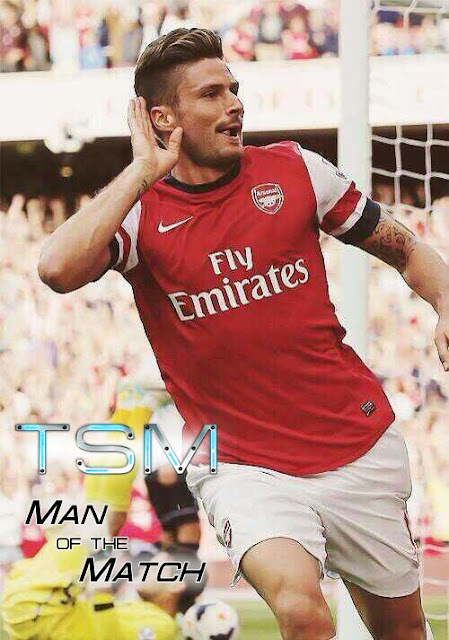 Arsenal lead going into half-time, after Olivier Giroud's superb finish. Each team had their fare share of chances, but they were thwarted by great defence and goalkeeping or majorly squandered with poor play. Entertaining first 45 minutes, things seemed all to play for in a very open game. Tottenham changed the game quite a bit when the ball was rolling for the second half. Once again, Paulinho was making an impact with his chances - although nothing came from the corner. Spurs appealed for a penalty in the 52nd minute as Koscielny seemed to plant two hands on Roberto Soldado in the box. The referee made the right decision by continuing play. After around 10 minutes on the pitch, Mathieu Flamini received a yellow card for his foul on Danny Rose. He may have got the ball, but with the studs up, he was rightly booked. Giroud could have scored another with an excellently-orchestrated piece of play by Santi Cazorla, setting up for a curling effort that was deflected off a defender before Lloris pushed it round the post. Giroud would later capitalize on Dawson's poor use of possession, feeding it to Walcott but Lloris got there first. Etienne Capoue suffered an injury 73 minutes in, looking in a lot of pain. The French International was taken off on a stretcher, and made way for record signing Erik Lamela to make his Premier League debut. Things really got tense as the match concluded, Arsenal had a few chances to wrap things up and looked threatening on the break. They did not seem hesitant nor panicked at the back. Subsitute Monreal could have put the game to rest but Kyle Walker saved it momentarily. Sczceny retained Arsenal's lead with an amazing save from the bottom corner of the goal after a set piece. More blocking by Arsenal's defense put the ball out to Walker who fired it wide accross goal. There was a tense conclusion to the game with five minutes of stoppage time. It was a nail-biting finish to the game, fighting ferociously to keep the lead, complete edge-of-your seat stuff. Remarkable. What a tense finish to the game. Olivier Giroud once again opened Arsenal's scoring in the North London Derby. He has scored all three of Arsenal's opening goals this season. Jack Wilshere picked up a knock just before half-time, and is likely out of the England squad. With Brendan Rogers also announcing that Daniel Sturridge and Glen Johnson are doubtful, Roy Hodgson's England squad is in turmoil. With deadline day quickly approaching, Tottenham and Arsenal are set to be pretty active. If these performances are anything to come by, there is still a lot to do. Arsenal's defence was essential in maintaining their lead, they kept calm and even when the tension was high, they dealt with it well. Frustrating loss for Tottenham, massive win for the Gunners. For the Spurs, it is a case of the final part being lackluster. Arsenal's defense maintained their victory, solid defending by the back four. Despite the performances from both, active transfers are indeed needed. The finish to the match was nail-biting, every Spurs and Gunners fan must have been pacing up and down, what a frantic end to the match. Arsenal pick up an imperative victory at the North London Derby. Three important points gained for Arsenal as they squander Tottenham's 100% record. They have got the points, now we will see if they will spend the cash as the Transfer Deadline nears. 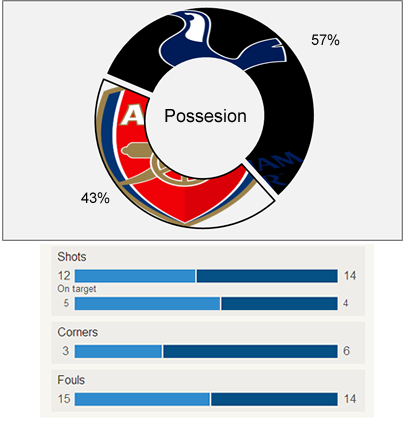 MATCH COVERAGE, RESULTS, FROM ARSENAL FC VS. TOTTENHAM HOTSPURS IN GAMEWEEK 3 OF THE 2013-14 PREMIER LEAGUE SEASON.